An image immediately after the Pegasus Pipeline ruptured in Mayflower in 2013. A settlement between the federal government, the state of Arkansas and ExxonMobil is now final over a lawsuit the governments had filed against the pipeline company over environmental violations arising from the 2013 Mayflower oil spill. U.S. District Judge Kristine Baker approved the agreement Wednesday. Listen to the radio report. The proposed consent decree between all parties was announced in April. Under the settlement, ExxonMobil must pay a total of $5 million dollars in state and federal penalties for violating the Clean Water Act and other environmental laws. 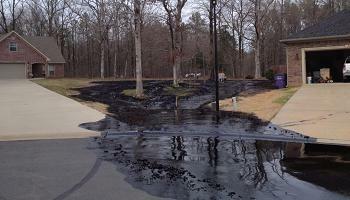 The company's Pegasus Pipeline ruptured on March 29th, 2013 in a residential subdivision of Mayflower, spilling an estimated 134,000 gallons of heavy crude oil into streets, yards, streams and wetlands around Lake Conway. John Tynan, Director of Customer Relations and Public Affairs of Central Arkansas Water—one of the most vocal critics of the consent decree—says while the utility disagrees with the outcome, they will continue to pursue “other avenues” to convince Exxon to move the Pegasus pipeline out of the Lake Maumelle watershed. The lake is a source of drinking water for nearly 400,000 people in and around Little Rock. “CAW has been in dialogue with ExxonMobil, we're going to continue those. And hopefully [we] can mutually agree on a number of integrity improvements,” Tynan said. The pipeline rupture in Mayflower was determined to be caused by a seam failure in a weld that was original to the pipeline's construction. Exxon is appealing an order by the Pipeline and Hazardous Materials Safety Administration or PHMSA after the agency found nine violations and fined the company $2.6 million. PHMSA is expected to issue a decision on that case in the near future. “As the court held, the consent decree is fair adequate, reasonable, and consistent with the Clean Water Act,” Keil said. On the upcoming PHMSA decision, Keil said “We'll continue to ensure the maintenance and any future operation of the pipeline remains in compliance with all relevant U.S. Department of Transportation standards and regulations.” PHMSA is a division of the Transportation Department. “We're pleased with the court's approval of this important settlement, which is good for public health and the environment of Mayflower, a community that was so disastrously impacted by this oil spill. It will also help prevent future disasters by requiring better pipeline safety and response measures." The Justice Department responded last month to CAW's earlier objections to the consent decree (which were sent in a letter to Judge Baker), saying the utility's main concern—removing the pipeline from the Maumelle watershed—was outside the scope of the agreement.